Like the brackets for the thick vertical plate and the heavy thick metal base with the rubber feet. One question I have is, why are the bellows extended so far from the motorized focus stage? Seems a micro-positioning stage between the focus stage and bellows base that allows movement in the same axis as the focus stage. 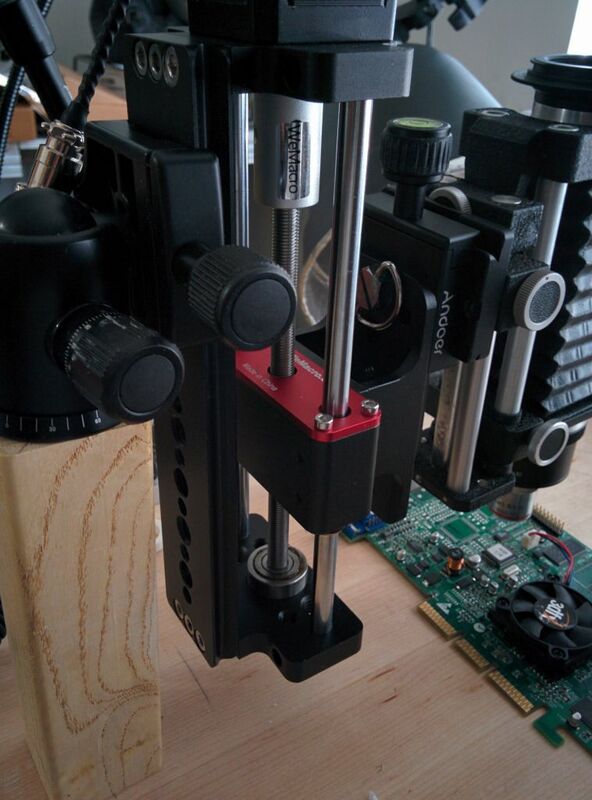 I am also worried about the length of the rig at x axis. At first there was no stage between del-tron stage and the bellows. Then I decided to put a stage between them for manual adjustment. I plan to change the red 3d printed top plate with a metal one. I finally finished my vertical rail too. I am open for any advices, thanks! I'd like to make something similar, but my metal working resources are strictly limited. Instead I've gone with a thick wooden cutting board and interchangeable wooden furniture feet that screw into a threaded insert in the cutting board. So far it seems to have worked relatively well up to 10x. I just model them and my mechanical engineer friend checks it and we negotiate with him and send to makers then they prepare it at least in 1 week. I think that the fundamental structure is very good. However I have to agree that there are too many components (and too much distance) between it and the parts you actually need. All of that weight towards the middle of the plate acts as a lever. You have a lot of reach and linear working distance, but also opportunity for flex and movement. I've got yet another even longer furniture foot that I'm thinking of using SOLELY for vertical shots. Instead of mounting a ball head on top (actually the bottom), I'm going to mount the base of the Wemacro to it, pointing down. That'll give both additional vertical adjustment and less of a lever force. 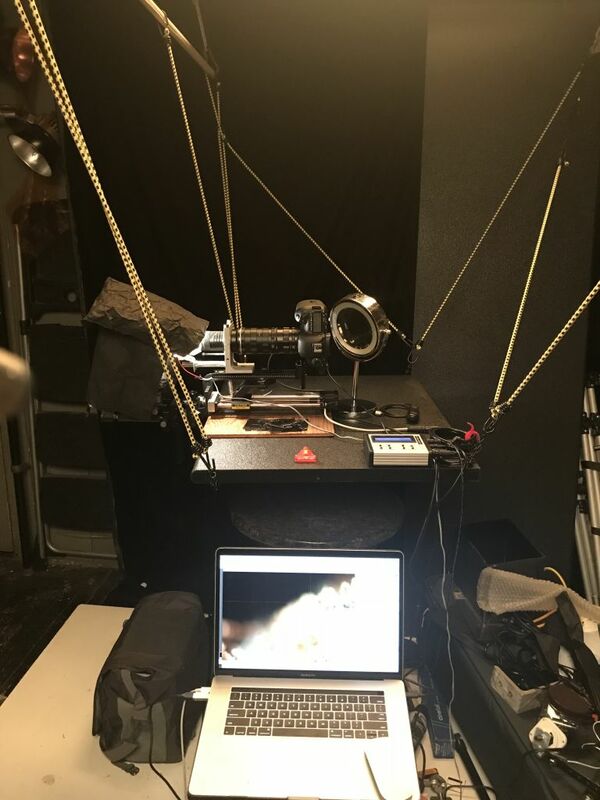 I have solved my vibration issues from traffic, etc, by hanging my entire setup from bungee cords. multiple 4' bungees are attacked to a slab of MDF at various angles. My Stackshot and subject stage are mounted to the slab. Angled bungees quickly settle down the swinging after camera or subject adjustments, and I no longer have any transmitted vibrations from traffic, or walking near the set. Could you send a photo of your system? 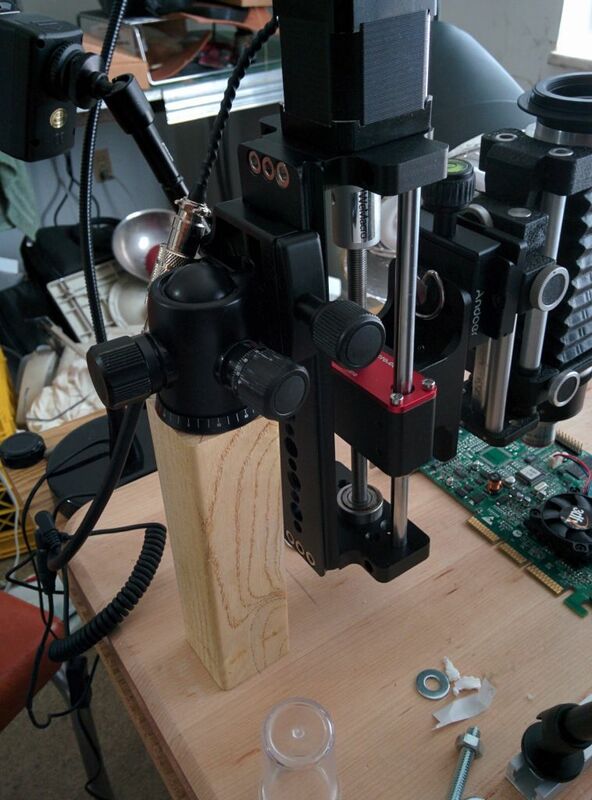 Stackshot is screwed onto a 12" square of 3/8" paneling, which is C-clamped onto the edge of the MDF slab. The subject & background stage has L-R and up-down rack & pinion movement. Lighting is a strip of 95 CRI LEDs mounted in an arc above the lens with diffusion. Black Cinefoil sides and top shield the subject from room light' The mirror behind the camera lets me see the LCD during shooting, from my seat at the laptop. I had a custom tripod collar made for my Laowa 25 mm Ultra Macro because the factory version is too flimsy, and incorporated tapped holes for mounting lighting, etc. Using extension tube and additional camera support fo 10X shooting.